Few Sufis in history have achieved as much renown as Jalāl al-Dīn Rūmī (1207-1273), also widely known as simply Mawlānā, ‘our master.’ Of several hagiographical texts dealing with the life of Rūmī, the most expansive and best known is Manāqib al-‘ārifīn by Shams al-Dīn Aḥmad-e Aflākī, written in the early 1300s, decades after Rūmī’s death. In addition to Rūmī’s life, Aflākī includes the lives of several other saintly figures associated with Rūmī, drawing upon what seems to have been a vast reservoir of stories and anecdotes available to him. The resulting text, while imbued with many of the conventions of Sufi hagiography, also contains glimpses into everyday life in 13th century Konya. Formerly the center of the Seljuk Empire, Konya was by the lifetime of Rūmī under the rule of the Mongol Ilkhanids, albeit as a somewhat peripheral, frontier-like province. As had been the case under the Seljuks, Anatolia continued to be a place of cross-cultural interaction and struggle, and while increasingly politically decentralized and fragmented, host to both outstanding scholars and to networks of merchants and traders. Muslims may have been the majority population by Rūmī’s time, but members of various Christian confessions were still sizable and probably made up the majority in some places. In the story below, in addition to the argument for the exalted nature of Mawlānā’s spiritual state, we get a glimpse of the market culture of Konya, and its possible ties to distant places. We also see some of the possibilities in the life of a woman in this period; the account is, not insignificantly, attributed to a woman, Mawlānā’s wife. Her maidservant acts as her representative in the market, unsurprising for a woman of exalted social class in this period. The account is also shot through with a rich sensuality and aesthetic sensibility, summoning for us not just sights and sounds of medieval Konya, but even smell- which is here bound up with the memory of sanctity, activated through the long-lasting lingering of the beautiful odor of the miraculous roses: memory that must be guarded lest it be misused, but, in the right noses, is both spiritually and sensually pleasing. 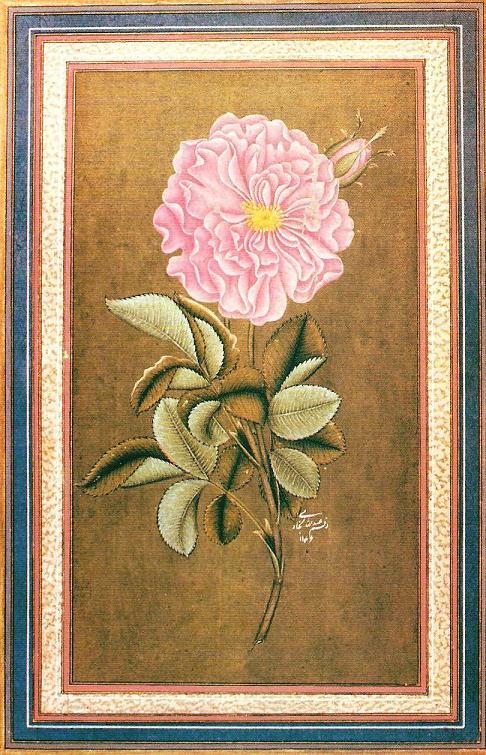 A rose by the Ottoman artist Abdullah Bukharī, c. 1733. And it is said that Kerā Khātūn kept these petals until her final breath. But it happened that she gave a few petals from the bouquet to Gorjī Khātūn, the wife of the sultan, and this she did with Mowlānā’s permission. Whenever someone suffered pain in the eye, once a petal was rubbed on it he would be cured. The color and fragrance of these roses never underwent change thanks to the blessing of those esteemed persons whose bosom was perfumed with musk. 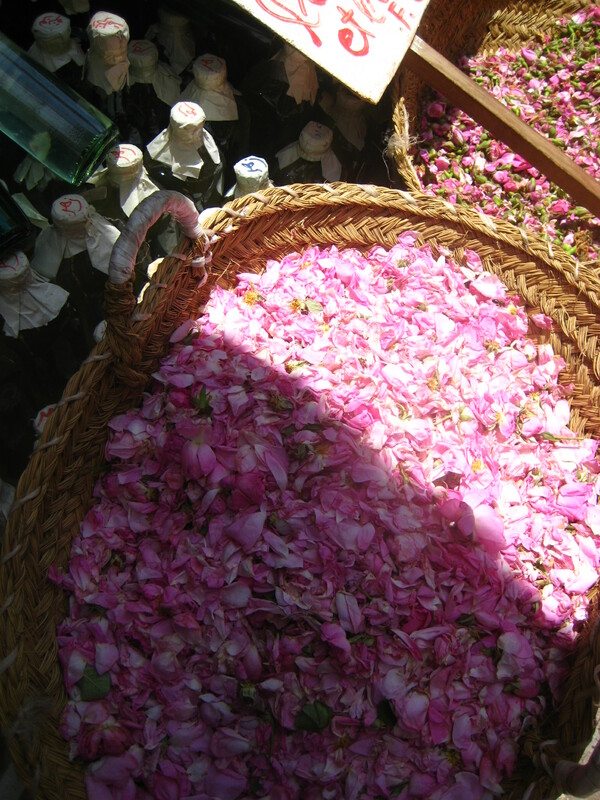 A basket of rose petals and bottles of rosewater, Fes, 2008.